Put simply, WordPress is very powerful. It is a Content Management System (CMS) so can control your whole website, from the homepage, additional pages and a blog. In addition to the thousands of plugins available which can make it do many, many more things. This is why it’s the worlds most widely used website and blogging back end. Diesel linked an instore experience with Facebook via QR Codes… Simple, effective for established online brands with bricks and mortar store experiences. Are you getting the most out of your Blog? Everyone has a blog these days, but if you are a brand, in business or trying to be a professional blogger then you need to make sure you are getting the most out of your blog. For first timers this little video will run you through how to put up a blog post. It doesn’t matter if you are using a free blogging service like blogger, tumblr or even a self hosted wordpress blog, these options will all be available and should be used. We know google reads our sites and getting traffic from google searches is what we want, by making sure you follow the below steps, you can ensure your organic google results will grow. All my clients use a self hosted wordpress blog, so these examples are specific to those controls and features, on other platforms where you find these options may differ. Google and other search engines should be an important part of any blogging marketing strategy, 52% of my traffic comes from google alone. WordPress has good SEO by default but to improve your content and have a little more control over it you should install the plugin called “All in One SEO Pack“. The plugin is easy to install and use, it optimises your WordPress blog for search engines. This allows you a simple way to define each posts (as well as your internal pages on your website), Title, Description and Keywords which are used in the code behind the post. Categories are the general topics you blog about, each article you publish should be categorised into one or a couple of these categories. The Uncategorized category should not even exist, if all your posts fall under this then you are missing out on potential new traffic. 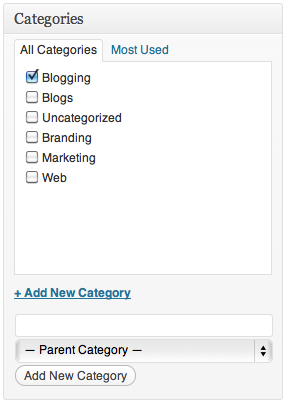 Try to create all your categories when you start your blog, adding categories on the fly will create a mess, confusion with your blog and too many unnecessary categories down the track. This is what Google, Bing and Yahoo will index from your site and will show on the results page when someone is searching. It is just as important as the headline of your post and should be similar, keep to under 60 characters to best display in search results. This is the Meta Description and will be indexed by google and display in search results. If this is not defined google will just take an extract of the content on the post or page and post that. However it is important it is written and is relevant to the post, encouraging people to click through from google to read your full post. Keywords should be ones you have used within your post, the title or somewhere in this blog post. Make sure they are relevant to the post otherwise google won’t take notice of them. Search Engines can’t index or read images if there is no text. This is the Alternate Text option you see when uploading an image. Getting imaged indexed along the lines of the keywords you are targeting will also help your SEO. Now your content is optimised for google and other search engines you need to promote and share the content. Copy your blog post URL (the web address) and paste it into Facebook. Pick the image you wish to display with the post and publish your article to your friends or followers. Manual posting like this is more effective, but if you are strapped for time there is a great app which will check for updates on your blog and post to your Facebook page. RSS Graffiti is easy to setup and once set will post a link to each blog post not long after you make each one live. Ideally tweeting an update needs to be done many times, twtter is all about now, right now, so just tweeting Tweeting once is not enough. A new post needs to be given a few tweets on its day of publishing. Twitter is like a newsfeed not an inbox and users will only get a snapshot of whats happening in the world of twitter each day. Another tip is to tweet it @ relevant people, spread the news and ideas in your blog personally directed at other users who are relevant. This can increase the chances of getting a re-tweet and your message going viral. Often the forgotten social network, LinkedIn is has over 150 million members and will drive traffic. More important for B2B focussed blogs and information. This social network has been around for a while now and it seems there is a re-emerging power in StumbleUpon, so post your update to this social network as well. The new kid on the block of social networks is all about images, if you have rad images in your blog posts you need to add them to your boards on Pinterest. Pinterest does drive traffic. Best to cover all bases, not a big traffic driver at this point in time. But everything google has its hands on seems to have some sort of power and it can’t hurt SEO to share on Google Plus. Every time someone visits your website there should be an opportunity for them to subscribe to your mailing list and if you have a mailing list of subscribers, past customers and potential customers you should be emailing them. Email is still a very powerful marketing medium in the social media age. This marketing channel used to be the only way of sharing content with people before social networks were developed. Email is still personal and gets direct to your customer base so it needs to be managed carefully. Have a read of my post on What is Email Marketing? How can I get stated easily? to get some tips on how to get started. These days you need to be everywhere with relevant content and with the power to share it to those who want to hear it. From simple print ads, to email, to twitter, facebook, blogs, linkedin, pinterest… It’s just got complicated, but integrated. Facebook love to mix things up, but if it ain’t broke why fix it? They seem to make major changes very often, once you think you know how to use it they throw in a totally new way of doing things. Come March 30, 2012 your personal Facebook pages will be switched over to a Timeline, so it wont be too long until the business pages are made to make the switch to. We may as well suss out what we need to do and what benefits there are… **EDIT At the end of March all Business pages will be switched over to Facebook Timelines. Brands will have a very similar Timeline as personal profiles now have. It will display a cover photo at the top of the page, then the page will be separated into two main columns by the dividing line, representing the passage of time. Brands can outline corporate history with milestones, product launches, openings and other events which will create a narrative for audiences. Remember when the tab links were at the top of the page? Then they moved to the left, well on a timeline they are gone. Applications for your page will still exist and will be shown under the cover photo, sort of a pictorial version of the old tabs that showed at the top of the page. However only three tabs will be viewable without the user expanding the drop down box. No more pretty picture with an arrow pointing to the LIKE button… Everyone will initially see the timeline when visiting a page. Is this a way Facebook is increasing the value of Facebook ads? To place importance and feature certain content, Facebook have taken a feature used in many a fashion social network. The Pin. Any content Pinned will appear at the top, flagged with a small orange flag. Only one Pin can be used at any point in time, the Pin will drop off after 7 days, or when new content is Pinned. The old 520px wide tabs will sit in a new 810px space, existing content will just be centered. Simple really, brands can send and recieve messages with people. Customer service type enquiries can now be dealt with in private on Facebook. So what are your plans for the new Facebook pages? Will you fully redesign and change the way you use Facebook? Or will you just leave it and deal with it down the track? Leave a comment below. A little bit of inspiration from the creators of some rad surf brands. Results: the bar reported an overwhelming response. With 85% of smart phone users opting for the buddy stamp in the club, customers even shared their experience online (via social networking sites, which helped promote the local bar to other Facebook users). Interaction by customers and word of mouth via social networking resulted in huge brand exposure. © Copyright 2014 Jonno Rodd.